Low clouds shroud a forested ridge overlooking a beach at Beloi, Atauro’s near-comatose main port. Palm trees tower over a beach near Vila. 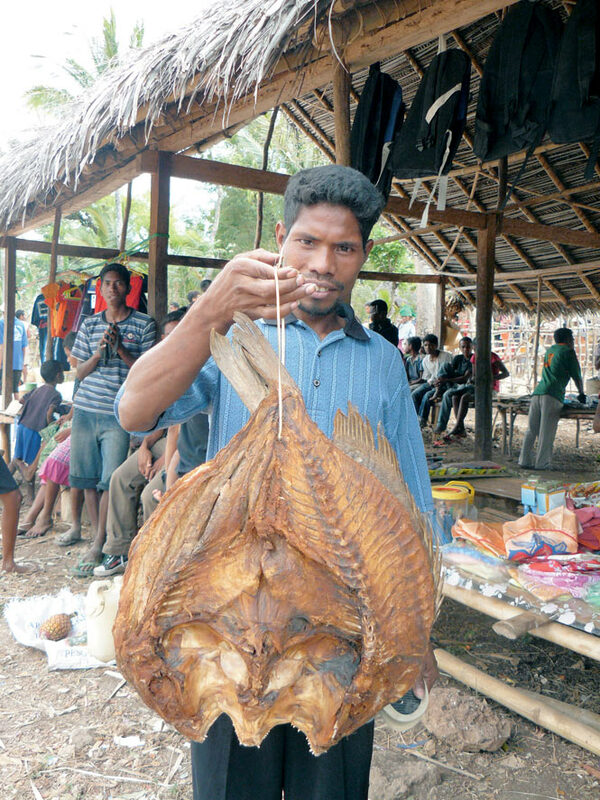 Dried fish for sale at the Makadade market. Cruising out of Dili’s harbor on a speedboat bound for Atauro. Above: Coral gardens in front of Barry Hinton’s eco-lodge at Beloi. The French in Indochina had Con Dao; the British Raj had the Andamans—penal islands used by the colonial powers of their day to incarcerate dissidents, criminals, and the like. 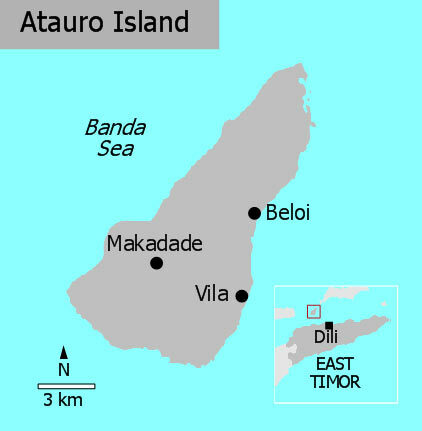 The Portuguese, who occupied East Timor (now officially called Timor-Leste) for 455 years, dispatched troublemakers to Atauro, a blip in the ocean set directly in front of Dili, 30 kilometers across the Wetar Strait. And true to the adage that we build our own prisons, this is where East Timor’s last Portuguese governor retreated ahead of the Indonesian invasion of 1975, lingering for three months before abandoning the territory for good. 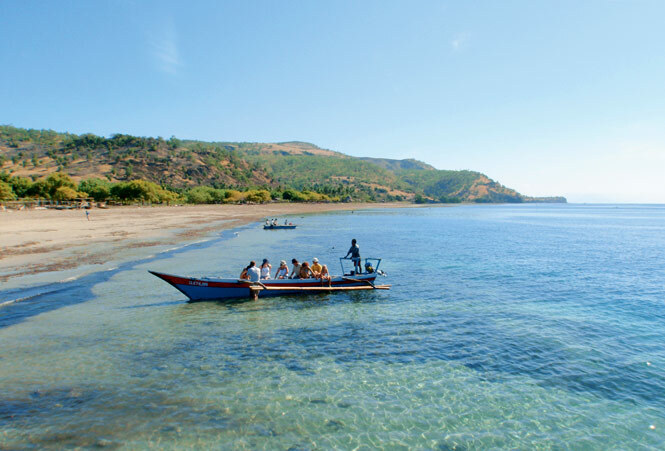 Today, Atauro attracts a different kind of exile: expats based in Dili looking for a quick escape from the once-sleepy capital. 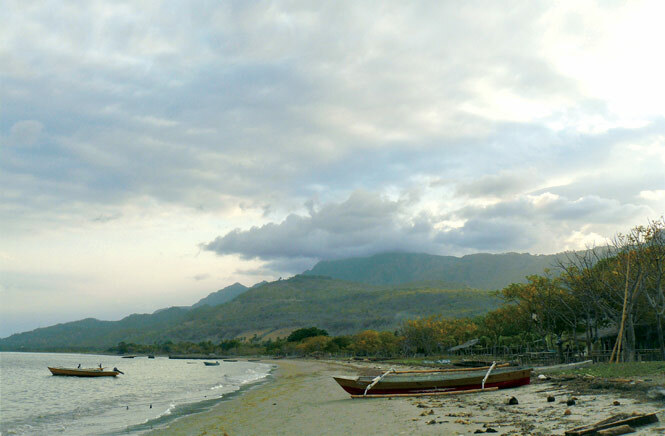 On a clear day, one can see the outline of this 25-kilometer-long volcanic island from just about anywhere in Dili. Yet like most places in East Timor, which achieved its hard-won nationhood from Indonesia in 2002, getting there is easier said than done. Until recently, the only way to do so was on a seafaring ferry that departs from Dili every Saturday morning and spends three hours on Atauro before turning home. Visitors had to choose between staying either an afternoon or a whole week, or hitch a ride home on a rickety fishing boat and pray for calm seas. 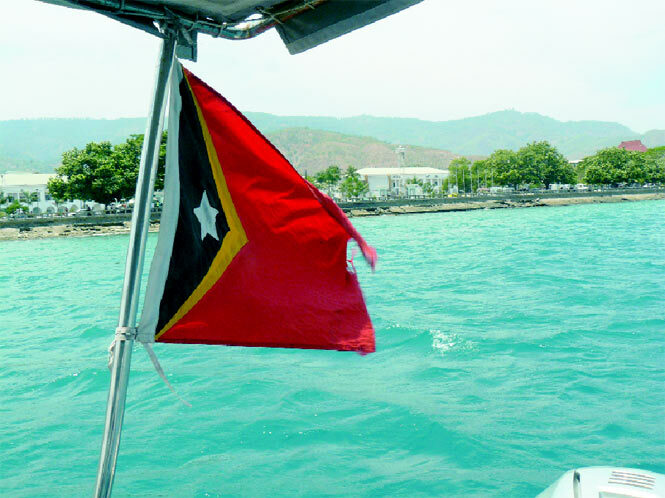 But East Timor is quietly changing. The country has enjoyed relative peace and security since civil strife last struck in 2006, fostering an environment conducive to investment and growth. A new wave of entrepreneurs are now making their presence felt here, keen to capitalize on the country’s enormous ecotourism potential. Among them is Australian Kym Miller, co-owner of one of two charter companies now operating out of Dili. With five vessels on inventory, Kym and her crew offer a variety of day and overnight trips, as well as transport to Atauro. Aimed at high-end, short-stay tourists flying in from Darwin and Bali, the service doesn’t come cheap, though the experience is unique. Two hours after departing from Dili, we are anchored off Atauro’s sparsely populated west coast. A small village marks the only human presence in the area, where naked children run along a palm-fringed beach. The water is a perfectly translucent blue, affording glimpses of a coral shelf that I’m told is 60 meters wide and begins just three meters offshore. “The visibility here is excellent because there’s no runoff,” Miller says, meaning Atauro has no river systems. And while I later learn that the absence of groundwater is a cause of great hardship for the island’s 10,000-odd residents, it’s a boon for a good variety of marine life. Within moments of diving in, I spot a sea snake, thousands of reef fish every color of the rainbow, and a turtle bigger than me. But the most dramatic spectacle is yet to come, when we cruise to a spot off the southern point of the island and start coasting around in circles as though we are lost. “What are we doing?” I ask the skipper. Before I finish my sentence, I see a group of hazy gray shadows dancing across the surface. Suddenly we are surrounded by them, hundreds and hundreds of bottlenose dolphins racing alongside us and catapulting themselves through the air. The performance is spellbinding and relentless. I’ve never experienced anything like it. It’s late in the afternoon by the time we circumnavigate the island and pull into Beloi, where another Australian, Barry Hinton, runs a small eco-lodge. Comprising four communal, double-story bungalows and a series of open-air huts fitted with daybeds, it’s as low-key as you get, but surprisingly well equipped. Solar panels provide electricity at night, Internet access is available on request, and bicycles and snorkeling gear are lent out for free. “It’s extremely isolated, but very comfortable,” says Dili resident Ben Kildea, the only other guest I meet during my three-day stint on Atauro. “Life can get pretty crazy in Dili. 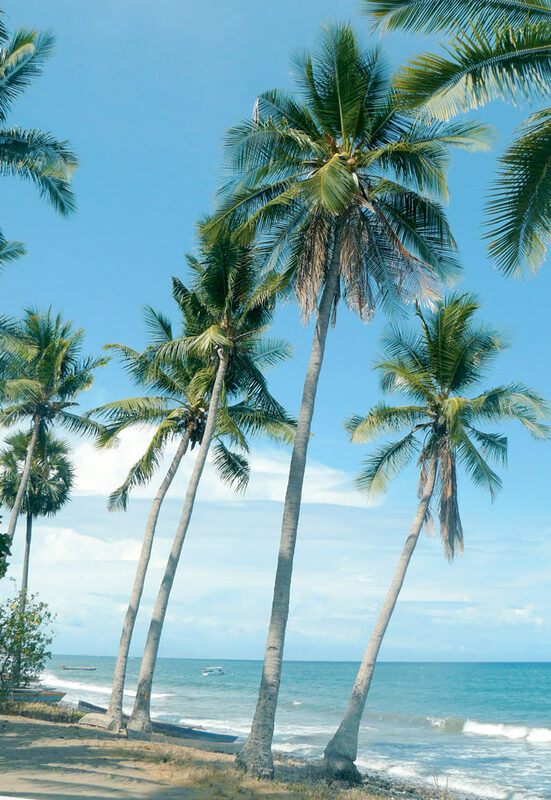 Here, there’s just peace and quiet.” I spend the rest of the day lying in a hammock, peering across the strait, until Barry’s wife calls us in for the evening meal: a veritable feast of fresh garden greens, coconut fish curry, cassava chips, and tropical fruits for dessert. Early the next morning, I hear a knock on my door. Barry has arranged a tour of the island provided courtesy of the local constabulary. But when I step out to meet them I see they are Filipinos, part of the United Nations presence in East Timor. After a quick breakfast we’re off, charging along a dirt road in a gleaming white Land Cruiser. A half-hour drive takes us to the village of Makadade, home to a shaggy outdoor market. Unlike the animated folk of the mainland, the people of Atauro are reticent and reserved. In Makadade, they also look somewhat malnourished, chewing betel nut incessantly and drinking rancid palm wine (tua mutin, or “old white,” in the local language, Tetum) from old water bottles. We jump back in the car and continue our tour, crossing grassy hilltops where small horses run wild. At a precipice that tumbles hundreds of meters to the surf, we stop to admire the seascape. A few kilometers away lie the Indonesian islands of Pantor and Alor, with the more diminutive profiles of Kisar and Wetar trailing off to the east. Barry tells me how he arrived here in 2001 as a volunteer with Palm Australia, a privately funded NGO that delivers grassroots solutions to impoverished communities abroad. In Vila, the main town, he helped build the island’s first eco-resort, which is owned and run by the local community. He explains how he has to remain mindful not to be too much of a success, as jealousies can easily flare up on the island. The men he hires for sporadic construction work are banned from working elsewhere to ensure fair distribution of what little employment exists. “This used to be a prison camp, and the mentality has remained. As simple as life is here, it can be very complex,” he says. The next day, Barry and his family begin preparing for an international fishing competition, Atauro’s biggest event to date. Surrounded by deep channels and spared from destructive fishing practices common in Southeast Asia, the Wetar Strait is an angler’s dream. Tuna as big as 80 kilograms have been caught here, while Spanish mackerel and barracuda are abundant as well. Held on the last weekend of November each year, the contest also coincides with the whale-watching season. Fourteen different species, including blue whales, beaked whales, and humpbacks, traverse the strait during their annual migration from the Antarctic to the Philippines. I am told National Geographic will also arrive here soon to capture the whales on film for posterity. Compass Charters (670/723-0964; compassadventuretours.com) charges US$450 for a speedboat from Dili to Atauro, with space for eight passengers. A day trip, including snorkeling on Atauro’s west coast and a picnic lunch, costs US$800. Alternatively, the German-built Berlin Nakroma ferry leaves Dili at 8 a.m. every Saturday. Tickets cost US$20 return and are sold at the main wharf. Amenities at Barry Hinton’s Nima’s Lodge (670/723-6084; e-mail: boyhinton@yahoo.com.au; US$30 per person, including meals) are basic, but the setting couldn’t be nicer: all four beach houses are set just above the sand, overlooking lagoon-like waters. Dili’s FreeFlow Diving (670/723-4614) offers three-day PADI certification courses for US$350. A one-day dive with equipment, transport, and guide costs US$40.